On a forlorn, potholed stretch of Broadway in the nation's most dangerous city, middle and high school kids are happily making canoes and kayaks out of peanut butter. "We made the measurements on the boat, we put the nails in, we put in the peanut butter,'' says Angelika Rivera, sweeping back her long hair so it doesn't get in the way of sanding duties. It's not real peanut butter, but a peanut butter-like epoxy that acts as a glue and filler on the wooden boats. Rivera's classmates stand around a 16-foot Merrimac canoe they are building in an old brick building that is part of the South Jersey Port Corp. complex in Camden. The property was formerly home to the New York Shipbuilding Co., once the largest shipbuilder in the world. The only boatbuilding at the old shipyard these days is done by kids as part of the Urban BoatWorks program run by UrbanPromise, a faith-based non-denominational organization based in Camden. Fifty middle and high school students from four Camden schools participate annually in the program, which has made 22 boats in four years. Inside are boats in varying degrees of construction: the 16-foot Merrimac, an 18-foot kayak, a 16-foot cedar strip canoe, and a kayak called the Sea Duck. 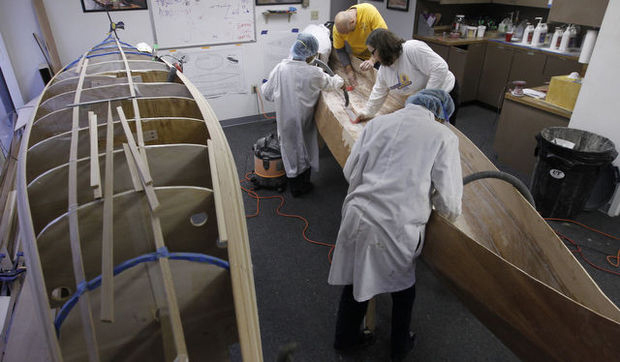 "I like building a boat since I never did it before,'' says Aniyah White, another 7th grader. The program started in 2009 with just five teenagers and several volunteers, who built three skiffs, named Faith, Promise and Grace. The boats were built in the basement of the former Church of our Savior, now being turned into the Camden Shipyard & Maritime Museum. Urban BoatWorks expects to move back into the museum in April. The museum's home has a nice ring of history to it. It was built of ballast stones brought from Greenland by Matthew Henson, co-discoverer of the North Pole. A statue of the African-American explorer with his faithful Inuit dog King stands in front of the church. The museum will include exhibits on regional maritime history and the boatworks. The first three boats built by Urban BoatWorks were launched from the nearby Cooper River Yacht Club in 2009. Every boat made at Urban BoatWorks is taken out on the water by the student builders. The boats are also used on outdoor trips run by UrbanPromise. Students apply to Urban BoatWorks; Rivera's brother, Brandon, preceded his sister in the program. "I saw one of the boats they made; that inspired me,'' she said. Asked what they liked least about the work, her boat building buddies were in quick agreement. "I hate sanding. It's boring and it makes me itch,'' said 7th grader Simone Harris. "The peanut butter,'' Rivera added. Volunteers include VanderKuip; Dave Schill, a private contractor; Bob Lehman, an attorney; and Chip Coward, an engineer. Cummings, who started the program, ran a carpet cleaning franchise for 20 years. When he heard Bruce Main, UrbanPromise's founding director, talk, Cummings felt "inspired,'' and eventually started UrbanTrekkers, a program where a total of 100 schoolchildren go on 14 outdoor and cultural "expeditions'' a year. Cummings takes 10 of the boats on the UrbanTrekkers' annual trip to Assateague Island. In summer, there are weekly boat trips on local rivers, through the Pine Barrens, and on Barnegat Bay. UrbanPromise started in 1988 with a summer camp held in an old Baptist church in Camden. The initial budget was $12,000, and the staff was nearly all-volunteer. The current budget is $3.6 million, and there are 55 full-time employees, with UrbanPromise the largest private employer of teens in Camden. Urban BoatWorks is not UrbanPromise's only program, but it is certainly the most hands-on one. "We've got to get that bump down so we don't have any air bubbles in our boat,'' VanderKuip told the students. Students spend two hours a week for 30 weeks in the program. The regularly scheduled snack time seems to be a popular activity here. There is avid munching of Doritos and Cheetos, and, with this group, plenty of girl talk. Aniyah White talks about a "ballet'' class and her teacher. After the snack break, it's time to remove loose sand in the canoe with denatured alcohol-soaked cloths. In between the sanding and peanut butter spreading there is plenty of good-natured back and forth between students and volunteers. The young boatbuilders call the volunteers called "Mr. Chip,'' "Mr. Dave,'' "Mr. Bob,'' and so on, and by 5 p.m. it's time to say goodbye to Mr. Chip and the others. "We're trying to teach them all facets of life,'' Schill said. "This is not just about building a boat. It's about showing up. Having pride in your work, not just banging it out.